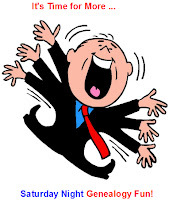 I'm going to be pretty much a total failure tonight for Randy Seaver's Saturday Night Genealogy Fun challenge. Lack of digitization is part of the problem, but not all of it. (1) Determine what is your longest unbroken line of ancestral gravestones: How many generations can you go back in time? Do you have photographs of them? (2) Tell us and/or show us in a blog post of your own, in a comment to this blog, or in a Facebook status or Google+ stream post. Let's see how lacking my contribution is and the reasons for that. I am happy to report that my father is still alive. That means that he has no tombostone, and therefore nothing for me to have a photo of. My mother was cremated and her ashes scattered in Choctawhatchee Bay in Okaloosa County, Florida. She has no cenotaph or other marker. So much for my parents. On my mother's side, even though I have seen it, I don't think I have a photograph of my grandfather's tombstone. I believe I have a photo of my grandmother's tombostone, but it was taken with a film camera and I haven't digitized the image. On my father's side, I'm not sure if my grandfather has a tombstone. If he does, I'm pretty sure I don't have a photo of it. 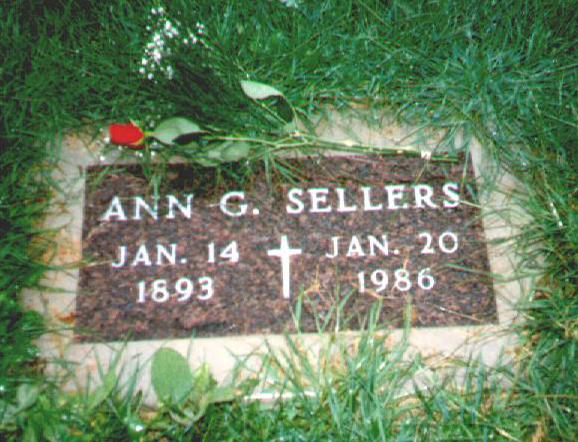 I do, however, have a photo of my grandmother's tombstone. (Finally!) Anna (Gauntt) Stradling [Sellers] was born January 14, 1893 in Westhampton Township, Burlington County, New Jersey and died January 20, 1986 in Lindstrom, Chisago County, Minnesota. 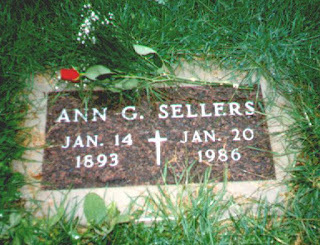 According to FindAGrave, neither Nana's mother nor her father has a marker in the Brotherhood Cemetery in Burlington County, New Jersey, where they are buried. So I have one generation in this unbroken chain! That's my grandmother, Lillyan (Gordon) Meckler, standing on the left and her brother Sidney Gordon on the right. I think this photo was taken at the unveiling of my great-grandfather's stone, but I'm not 100% sure about that. 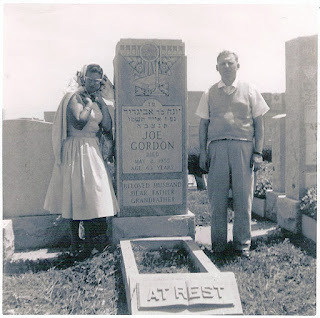 I also know I have a nondigitized photograph of the tombstone of Joe's father, my great-great-grandfather Victor Gordon. He was born about 1866ish in or near Kamenets Podolsky and died January 26, 1925 in Brooklyn. So even though I'm not able to post them all tonight, I have a chain of three generations of tombstones on my Gorodetsky/Gordon line. I have no idea when my 3x-great-grandfather Gersh Wolf Gorodetsky died or where he is buried, so I don't think I'll be adding that to my records anytime soon. And my maternal uncles are happily still alive. I think three is about as far as I'm likely to get for a while. Obviously, I have not made a huge effort to photograph tombstones of my family members, nor to digitize the ones that I do have. I guess I can't do everything! Once you're settled in, you'll have to spend some time each week to scan your records. The two photos you posted are very nice. I am sure the others will be too when you get them scanned. Good luck. Thanks, Marian! I know I have several photos of tombstones. One of the benefits of digitizing them is that I'll probably get them all in one place at the same time.